BLAEU - Biscaia et Guipuscoa Cantabriae veteris Pars. BLAEU, W. - Biscaia et Guipuscoa Cantabriae veteris Pars. Biscaia et Guipuscoa Cantabriae veteris Pars. 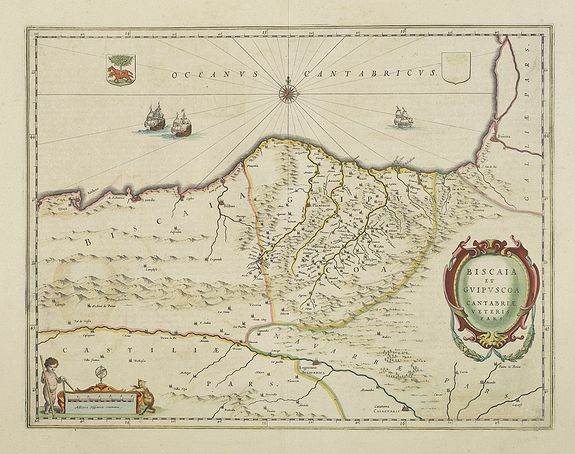 - BLAEU, W.
Title : Biscaia et Guipuscoa Cantabriae veteris Pars.. Size : 15.0 x 19.7 inches. / 38.0 x 50.0 cm. Description :Shows cities of Bilbao and Laredo, and includes a charming vignette of a putti with surveying equipment, being observed by a kitten. With Dutch text on verso. Condition : Paper very slightly age-toned. Good and dark impression. Good condition and wide margins.